Cella’s Sweets is a local bakery owned by Josh Mangan. The bakery specializes in 3D cakes that are amazing! I got the opportunity to interview Josh about his bakery and I’m sharing with you below! You can also check out his blog for some funny baking stories. I have always loved to show off. Whether it’s sports, work or play, I love attention so naturally I would go above and beyond when it came to family get-togethers. I’d try recipes that others deemed ‘hard’, and they didn’t seem that way to me. It was fun for me to take more than cupcakes to family gatherings. I kept tweaking recipes until I found my own take on every day desserts. What do you enjoy most about Cella’s Sweets? The response I get from everyone who enjoys my desserts is why I like to bake. My favorite dessert to make would have to be the coconut cake, mainly because I used toasted coconut soaked in Malibu Rum to decorate it. The chips make a lovely snack while preparing the cake. What has been your most difficult project? Two different cakes come to mind. 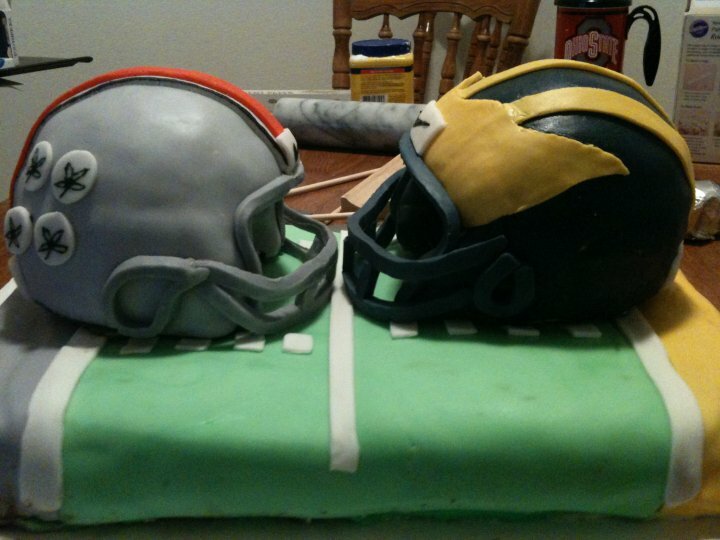 The first is my Rivalry Cake with a Michigan helmet and a helmet from THE Ohio State University. The difficulty was due to making my own fondant. While it was the best fondant you would ever taste, it was not very pliable- not to mention I ran out of fondant a couple hours before the party I was taking it to and it takes 8 hours for my fondant to be ready. 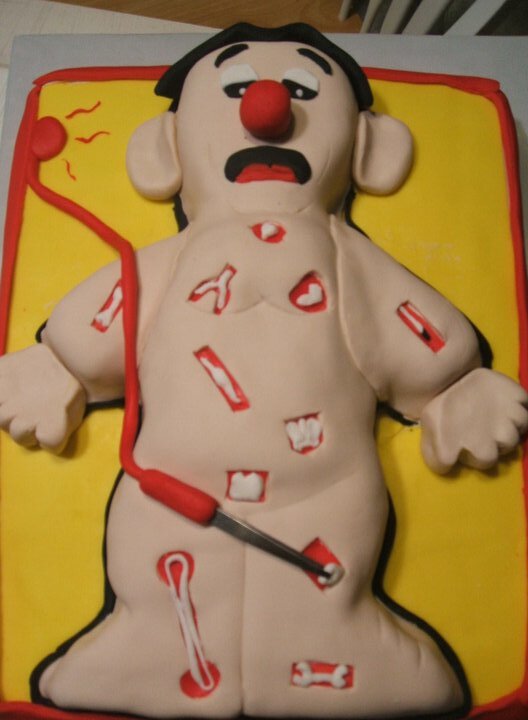 The other difficult cake was the C-130 cake. Not only was it difficult to make a cake look like a cargo plane, but the recipient was 3 ½ hours away. I had to somewhat assemble it before I left, disassemble it to load it into the car, then reassemble it when I got there – not to mention my heart was racing the whole time I was in the car. What accomplishment are you most proud of in regards to Cella’s Sweets? The fact that 90% of my business is from word of mouth makes me very proud. I usually make 1-2 cakes a week based solely on others recommendations. Decorating the 3D cakes is a lot of fun. I usually have a lot of room to add personal touches to them, and that’s where I think I set myself apart from others. What do you wish you didn’t have to do as a bakery owner? Delivering cakes has to be the most stressful part of my job. Every bump, turn and idiot driver stops my heart as I have a cake in the back of the car. If I found a magic lamp with a genie inside, I would ask for cakes to be teleported to the proper venue upon completion. Do you have any plans to expand your business? I would say yes and no. Yes in the fact I am always looking for more tools to do my job – tools to make cakes look cooler while in the same breath easier. Originally I wanted to open a store, and some day that may still happen. However, I really enjoy my job and right now that is what is best for my family. So, if an investor came along and offered I may just open up a place, but, until then, I am content baking from home. What do you want people to know about Cella’s Sweets? We can add to any special occasion. Whether it’s a birthday, graduation, wedding, or just cake day at the office, a Cella’s Sweets dessert will be the topic of conversation for days after. 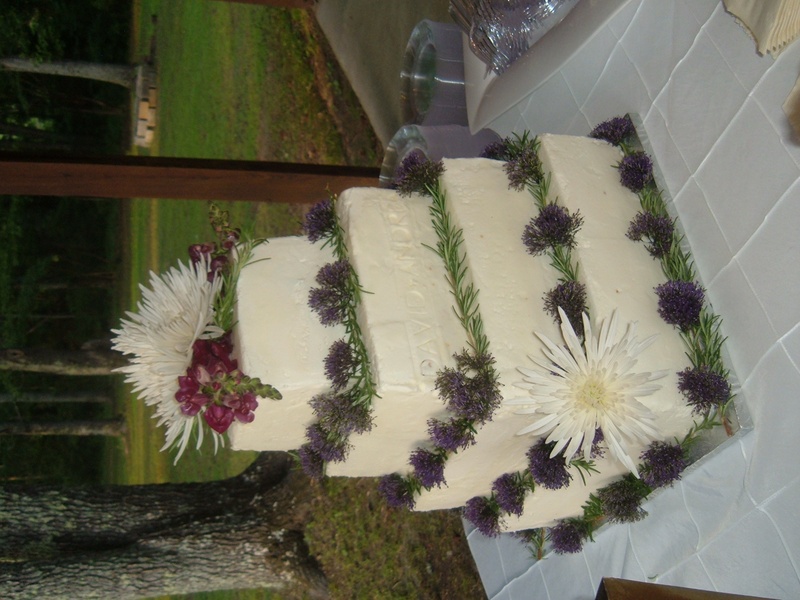 Become a fan on Facebook by searching Cella’s Sweets and let me know what we can do for you. 7 Responses to "Cella’s Sweets"
Wow – what a talented hubby you have! I can vouch for Josh’s coconut cake. Oh my goodness…one of the best desserts I’ve EVER had. To die for. And coconut is my fave anyway! Thanks for stopping by that day! It was nice to see you guys!